Once called "devil rays" by sailors and pirates, manta rays have long been feared as bad omens and monsters that could attach to a boat's anchor and drag it down to the ocean's floor. 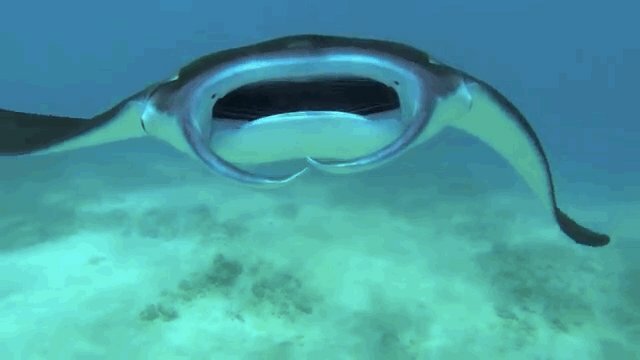 Manta rays are just the opposite - as this video, shot by diver Chris Clifone, shows. In fact, they are harmless gentle giants. It's worth noting that, like Clifone does, no diver should ever touch the plants and animals they encounter when diving. The largest manta rays can reach up to 3,000 pounds, but they are filter feeders and survive on tiny shrimp and krill in the water - they couldn't hurt a diver if they tried. Humans, in fact, pose a much larger threat to mantas than they do to us. The species is particularly vulnerable to overfishing, and are valued for their meat and parts in some areas of the world. Considered vulnerable by the IUCN Red List, they are also often caught as bycatch by commercial fisheries, and discarded dead or injured. It's worth noting that manta rays are a suborder of the stingray family, but don't have barbed stingers on their tails like sting rays (it was a stingray that tragically killed Steve Irwin in 2006 in a rare incident). Learn about efforts to save manta rays and how to help over at Manta Trust.